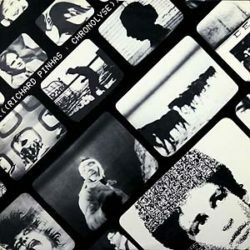 Bureau B presents a reissue of Richard Pinhas’s Chronolyse, originally released in 1978. Pinhas is one of the most important French electronic space-rock musicians. Following five albums with Heldon, his band, he released solo records from 1977 on. His transition to solo material gave the guitarist and synthesist an opportunity to work on material that was a little lighter and less constrained. Chronolyse was his second solo album. Following the previous year’s Rhizosphere(BB 279CD/LP, 2018), 1978’s Chronolyse was actually the first to be completed having been recorded two years prior. On four of its five tracks, Rhizosphere presents just the 25-year-old Pinhas and his synth alone together, a melding of man and machine that gradually becomes an expansive, outward-bound journey. Pinhas’s simple approach spawned a galaxy of diverse sounds and ideas. Each track on Rhizosphere inhabits its own mini-universe sonically and emotionally. The range of moods traversed is stunning. Dedicated “to all S.F. freaks”, Chronolysetakes its name from a work by the science fiction writer Michel Jeury. The individual track titles, as any sci-fi fan will clock, are inspired by the classic Frank Herbert novel Dune (1965). This led some listeners to assume that Chronolyse was some kind of scrupulous concept album based around Herbert’s invented universe of interstellar feudal houses and giant sandworms. That’s not quite accurate. While Pinhas remains a proud sci-fi freak, he’s quick to distance the album’s titles from the music contained therein. “I always name the titles of the tracks and albums when everything is finished,” he says. “So there is no relationship between them and what is inside.” The younger Pinhas had been inspired by guitar heroes such as Hendrix and Clapton. It was King Crimson’s Robert Fripp who had prime impact on Heldon’s mix of spiralling space-rock guitar and analog electronics. Indeed, Pinhas once said the three most important figures in the history of modern music were Richard Wagner, Béla Bartók, and Robert Fripp. At the time of Chronolyse’s gestation, Pinhas had been listening to a lot of classical music. Bach, Scarlatti, and Wagner were key. So, too were the new wave of American minimalist composers, Philip Glass in particular. The final record of Heldon’s 1974 to 1979 run of LPs would appear the year after Chronolyse; thereafter Pinhas would concentrate on projects under his own name. This vital release bridges the gap between these two phases of Pinhas’ remarkable career.